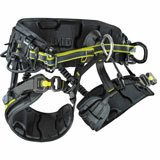 Tree Core is a lightweight, functional harness specially developed for arborists. Two Easy Glider buckles on the hips for symmetrical adjustment of the harness to fit the body. Ergonomically shaped padding for excellent wear comfort and maximum freedom of movement. Four textile eyelets on the sides, with two removable aluminium Screw Gate D-rings. Adjustable Sliding D Kit increases freedom of lateral movement. Efficient material management with four gear loops on the sides, 2 buckled straps and slide buckle loops (e.g. for chainsaw attachment). Adjustable leg loops can be fully opened thanks to Click Lock buckles.